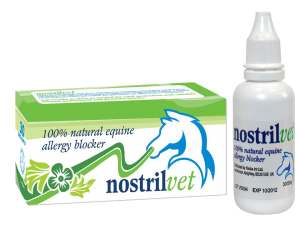 NostrilVet is puffed up your horse's nose & lines the nasal tract, forming a thin, colourless, mucus-like gel lining. This lining acts as a protective barrier, filtering out pollen, dust & bacteria, thus reducing the chance of allergic reactions. NostrilVet is plant based & 100% natural, so is safe to use whilst competing. Application Instructions: You should administer NostrilVet to your horse just before going into an environment where you know there are airborne allergens, eg. a dusty stable; or a field on a high pollen count day. NostrilVet can be reapplied every 3 hours if neccesary. 1500mg will last for up to 30 days. As a general guide, reapply every three hours.